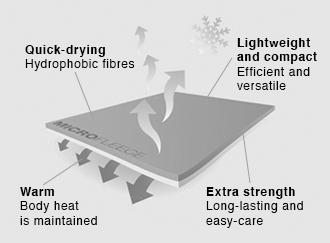 Microﬂeece is a lightweight, high insulation synthetic fabric. Critical performance for outdoor wear. As soft and warm as wool but with critical performance for outdoor wear. Its hydrophobic ﬁbres retain less than 1% of their weight in water retaining insulation power when damp and dry quickly. Microﬂeece is a light, compact and breathable fabric – efficient to pack and versatile for hot or cold climates. Its strong synthetic ﬁbres result in a lasting, ready-to-wear garment that’s easy to care for on the move.